OAXACA, Mexico – A Catholic priest known for his environmental activism has been accused of inciting a violent protest against a Canadian mining project in the state of Oaxaca that led to the deaths of a small-town mayor and a municipal official. Father Martin Octavio Garcia Ortiz denied the allegations stemming from the June 19 incident. He described the accusations as politically motivated revenge and said they come in the run-up to local elections July 4 that will try to unseat the incumbent party after 80 years of uninterrupted rule. The priest told Catholic News Service that his accusers abducted him, held him for six hours and beat him in a private home until state police rescued him. Father Garcia was subsequently ordered held for 30 days while judicial officials review his case. “I’m a government hostage,” Father Garcia said from his hospital bed in the state capital, Oaxaca city, as six state police officers guarded his room. The unrest reflects the ongoing conflicts over foreign-owned mining operations in Latin America, which often split communities between those in favor of job creation and economic growth and opponents who fear negative environmental and social consequences. It also highlights ongoing tension between priests and the governing Institutional Revolutionary Party in Oaxaca, a state with a long history of repressive rule by local strongmen and the scene of a social uprising against the state governor in 2006 that descended into lawlessness. “At the core of this (incident) … we’re seeing the (opposition parties) gaining force so they’re trying to stop it,” Father Garcia said. Father Garcia, pastor of the St. Peter the Apostle Parish in Ocotlan, Oaxaca, denied having any political motives for opposing the mining project, although he acknowledged that a mine opposition group he has supported is now affiliated with a coalition of four political parties running against the incumbent party. The disturbance broke out in the municipality of San Jose del Progreso, 20 miles south of Oaxaca city, as mine opponents returned from a political rally in a nearby community and were confronted by a pro-mining group and Institutional Revolutionary Party members. Details of the incident remain sketchy, but Father Garcia, who was returning from celebrating Mass in a nearby community, said he arrived after the confrontation began and subsequently was abducted by the pro-mining group. Father Garcia said he was taken to the home of a leader identified as Servando Arango and “beaten with sticks and stones” and whipped with a pistol. State police arrived six hours later, he said, after being lobbied by Archbishop Jose Luis Chavez Botello of Antequera, Oaxaca. In a June 24 statement, Archbishop Chavez said Father Garcia was threatened with death and being burned alive, and was rescued on the condition that he be detained. “(We) are working through all possible means to clarify Father Martin’s legal status and demonstrate his innocence,” the archbishop said. The incident claimed the lives of Mayor Oscar Venancio Martinez of San Jose del Progreso and Felix Misael Hernandez, a municipal official responsible for health affairs. The Institutional Revolutionary Party has alleged two groups involved in the 2006 Oaxaca uprising – the state’s combative teachers’ union and a coalition of left-wing protest groups, the Peoples’ Assembly of Oaxaca – were present. During a news conference, Arango denied hitting Father Garcia and accused him of “sowing discord in the community.” Arango called photos of Father Garcia’s injuries “vile lies,” and said, without offering proof, that the priest belonged to a shadowy rebel group known as the People’s Revolutionary Army, which gained notoriety in 2007 for bombing pipelines of Pemex, Mexico’s state-owned petroleum company. The priest’s defenders blasted the accusations of involvement in a rebel group – first floated by state prosecutors in 2009 – and said the 30-day detention was just the latest act in a campaign of hostilities against him. “He’s a person that has never been silent in the face of injustice,” the Oaxaca-based Bartolome Carrasco Human Rights Center said in a statement. 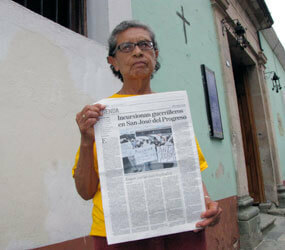 A spokesman for the mining company, Compania Minera Cuzcatlan, declined comment on Father Garcia and the altercation. He also declined to discuss mining operations. Father Garcia, whose parish serves the region surrounding the mine, has focused much of his ministry on environmental and human rights issues. He said he tackled the mine project because of concerns about a lack of water in the region and the possible contamination of water resources from mining byproducts even though mine operators promised to bring hundreds of jobs to a region rife with unemployment.